1. 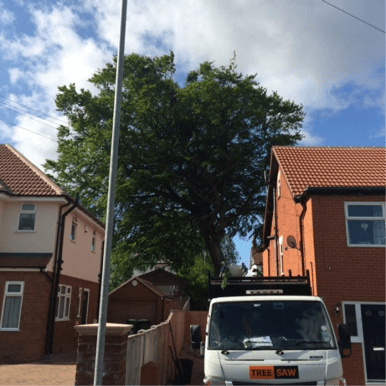 Treesaw pruned a large Beech tree in Alwoodley, Leeds reducing the height and spread of the crown by up to three metres as permitted by Leeds City Council in July 2015. 2. Treesaw was commissioned to prune several fruit trees and remove a Spruce tree growing in close proximity to a garage in Outwood, Wakefield in May 2015. Part of the work involved trees belonging to a neighbouring property for which we obtained their written permission before starting any work. Mr & Mrs S, Wakefield. 3. 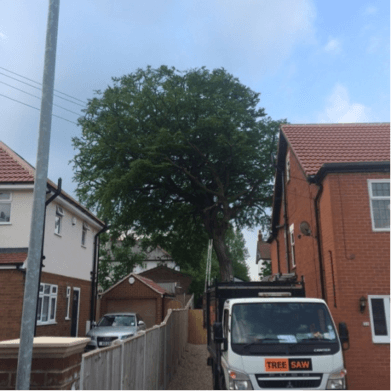 Treesaw was commissioned to prune (which included deadwooding, reshaping and crown thinning) several trees and to remove a Conifer and a Sycamore tree in a garden in North Leeds. Mr & Mrs S, Leeds.